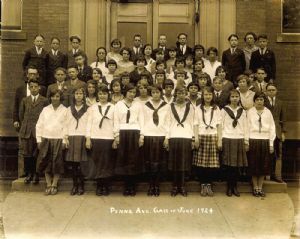 This photograph, taken in June 1924, is of the 8th grade. Margaret Troutman, who was on the editorial staff of the 1928 Quill, is the third from the left in the front row. Margaret, later Margaret Nixon, became a teacher in Washington County. Pennsylvania Avenue School, Cumberland, senior class. The photograph is courtesy of Ed Wagus.